Lugovaya T.S. Biometric human identification based on electrocardiogram. [Master's thesis] Faculty of Computing Technologies and Informatics, Electrotechnical University "LETI", Saint-Petersburg, Russian Federation; June 2005. Nemirko A.P., Lugovaya T.S. Biometric human identification based on electrocardiogram. Proc. XII-th Russian Conference on Mathematical Methods of Pattern Recognition, Moscow, MAKS Press, 2005, pp. 387-390. ISBN 5-317-01445-X. PDF copy in Russian is available here. Луговая Т.С. Биометрическая идентификация личности по электрокардиограмме: выпускная квалификационная работа магистра. Санкт-Петербургский государственный электротехнический университет "ЛЭТИ", Факультет компьютерных технологий и информатики (ФКТИ), Кафедра математического обеспечения и применения ЭВМ (МО ЭВМ); Июнь 2005. Немирко А.П., Луговая Т.С. Биометрическая идентификация личности по электрокардиограмме. Математические методы распознавания образов: 12-я Всероссийская конференция: Сборник докладов. - М.:МАКС Пресс, 2005. - с. 387-390. ISBN 5-317-01445-X. Электронная версия сборника доступна здесь. This research investigates the possibility of biometric human identification based on the electrocardiogram (ECG). The ECG, being a record of electrical currents generated by the beating heart, is potentially a distinctive human characteristic, since ECG waveforms and other properties of the ECG depend on the anatomic features of the human heart and body. Experimental studies involved 90 volunteers. Heart rate, physical and emotional state were not limited. For usability, Lead I was chosen, since it is easily measured and it is not sensitive to minor variations in electrode locations. ECG fragments containing QRS complexes, P and T waves extracted from the ECG were processed by Principal Component Analysis and classified using Linear Discriminant Analysis and a Majority Vote Classifier. Using this method on a predetermined group of 90 individuals, the experimental results showed that the rate of correct identification was 96%. The findings support using the ECG as a new biometric characteristic in various biometric access control applications. Biometric technologies are among fast-developing fields of information security, gradually entering into all spheres of human activity. Today only three biometric methods have proved their efficiency, namely, identification based on fingerprints, iris or retina, and face. Hand geometry, voice, writing and typing dynamics, etc. are also useful, depending on the purpose and range of application. This research aims to develop an identification system based on the ECG (figure 1). Electrical currents that are generated by the heart as it beats spread not only within the heart, but also throughout the body. Therefore, shapes of the ECG waveforms depend on human heart and body anatomic features. Thus one may consider ECG as a human biometric characteristic, as previously considered in [1, 2, 3]. This study suggests data interpretation and classification methods not used in these previous studies. The system developed in this study was tested on a larger set of live input data than used in previous studies, with a larger number of subjects, and the data from this study have been made available here to allow objective comparisons to be made with other methods. The respective studies are compared below (table 1). Figure 1. Example of ECG with standard notations. To determine the potential use of ECG as a biometric, it is necessary to evaluate how ECG satisfies the requirements for biometric characteristics. permanent, i.e., the characteristic does not change over time. "Good" biometric characteristics can to a greater or lesser extent satisfy these requirements, depending on the purpose and application of biometric system. The ECG is a universal characteristic, as the heart beat is a necessary sign of life, and it can be recorded with minimum inconvenience to the individual. To evaluate its uniqueness, and especially persistence, is much more difficult. The following are just some empirical arguments in support of ECG as a biometric. It is plausible to assume that an ECG is an almost unique human characteristic because morphology and amplitudes of recorded cardiac complexes are governed by multiple individual factors, in particular by the shape and position of the heart, and the presence and nature of pathologies, among other factors. As a result, QRS complexes have a variety of configurations and metrics (figure 2). Figure 2. Schematic representation of various QRS complex configurations and normal ranges of wave amplitudes and durations. The most obvious factor of the ECG variability is the heart rate variability. At rest, the heart does 60-80 beats per minute. During physical activity, or under conditions of stress or excitement, heart rate may increase to 200 beats per minute. Undoubtedly, such heart rate increases have some influence on the waveforms of the cardiac cycle, as its duration is reduced by 2-3 times. Heart rate increases mainly cause shortening of diastole duration (the baseline fragment of the ECG) and the ventricular depolarization period (corresponding to the ST segment in the ECG) and attenuation of the R wave amplitude. The duration of the QRS complex doesn't change significantly with heart rate, however (figure 3). In clinical cardiology, the dependence of QT interval duration of the heart rate is investigated for diagnostic purposes, and there are several formulas (of which Bazett's, Fridericia's, and the Framingham Heart Study's are most widely used) reflecting the dependence of QT intervals on cardiac cycle length (RR intervals). These empirically derived relationships presumably can be used for ECG normalization, i.e. scaling of cardiac cycle to normal heart rate. Figure 3. Variation of ECG of one individual with different heart rates. Another equally important question is the persistence of an individual's ECG characteristics over time. Since the shape of ECG waveforms is determined primarily by human anatomical features, the natural variability of which is measured in years, it can be assumed that the ECG signal will have slow and gradual variations (at least in individuals who do not experience traumatic events such as myocardial infarctions that alter relevant anatomical features between successive observations). To evaluate the tendency of ECG variability over time the set of ECG records of one individual was collected during the study. For each record the acquisition procedure including electrodes attaching was repeated from the beginning. Figure 4 shows variability of ECG cycles recorded within one hour (figure 4.A) and within six months (figure 4.B). On the figures it is seen that ECG cycles have no significant qualitative or quantitative variations over time, and the configuration of QRS complex and the ratio of amplitudes remain stable. Variations within an hour are almost identical with variations within six months. Observed ECG variations are more likely caused by variations in acquisition procedure and filter distortions. Of course, this is only the result of empirical observations and six months is too short a period to judge the variability of the ECG over much longer periods, but these results support the hypothesis of a slow variation. It is unlikely that there is a functional relationship that can correct for changes in the ECG depending on the time interval between observations (although there have been many clinical studies that report systematic age-related changes in specific ECG characteristics such as heart rate variability). Given this, it is likely that periodic updates of the training set records and classifier retraining will be needed as components of an identification system. Figure 4. Variation of ECG of one individual recorded at different times. Of course, there are many other natural and artificial, intentional and unintentional causes of ECG variability. For example, taking certain medications may temporarily change the configuration of the cardiac cycle. Some pathologies over time gradually change the form of the cardiac cycle. Moreover, human actions during the ECG recording can significantly distort or change the signal. Thus, an ECG identification system will face a variety of challenges that are similar to those posed by various attacks on other types of biometric systems. 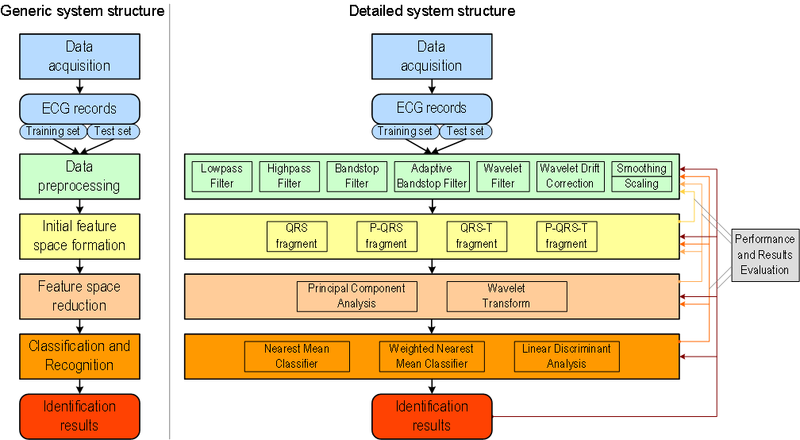 The identification system uses a classical scheme including data acquisition, data preprocessing, formation of input feature space, transition to reduced feature space, cardiac cycle classification, and ECG record identification (figure 5). Figure 5. Identification system structure. The generic system structure (figure 5, left) shows the sequence of essential data processing stages. Feedforward links show processed data transfer between stages. The output of one stage is the input to the subsequent stage. Each stage can be implemented using different processing methods. The detailed system structure (figure 5, right) shows methods considered in this study for each system stage. For most stages, these methods are alternatives, but the data preprocessing stage is usually comprised of several complementary methods. Identification system synthesis is a process of selection between alternative methods, determination of composition and sequence of complementary methods, and adjustment of parameters for all methods in such a way as to obtain the best results. It is almost impossible to perform an exhaustive search. In this study, a strategy of result-directed backtracking was applied. Multiple feedback links in the detailed structure scheme show that results obtained on one stage can influence decisions made in previous stages. In other words, usefulness of some changes in data processing on one stage can be evaluated by comparing the results of one of the following stages obtained before and after these changes. This empirical technique doesn't guarantee optimal results, but it yields more or less reasonable method selections without requiring excessive computation. Experimental studies involved 90 volunteers. ECG records were made in the sitting position. Heart rate, physical and emotional state were not limited. For usability, it is necessary to be able to collect the ECG easily and quickly. The procedure for ECG acquisition should be convenient for individuals and should require interaction with a minimal set of equipment; therefore it was decided to use single-lead ECG. Since single-lead ECGs vary significantly within an individual depending on the lead (the locations of the electrodes used to observe the ECG), the choice of lead is important. Lead I is the potential difference between the left and right hands (LA - RA). It was chosen because it is easily measured and it is not sensitive to minor variations in electrode locations. Limb clamp electrodes were used. This type of skin-electrode contact closely imitates the likely scenarios of user interaction with a practical identification system. The data collected for this study comprise the ECG-ID Database, consisting of 310 I-lead ECG recordings from 90 individuals, each 20 seconds long, sampled at 500 Hz with 12-bit precision. To train and test the identification system, the collected data were divided into two sets. 195 records were assigned to the training set and 115 records to the test set. Differentiation between the training and test sets aimed to provide for maximum performance complexity, i.e., maximum difference between records in different sets both in monitoring time and human physical state. The raw ECG is often rather noisy and contains distortions of various origins. Nevertheless it was decided to turn off all filters provided by cardiograph software, because it was unclear if they can suppress informative features essential for identification. Examples of ECG with different noise components are presented in figure 6. For each case possible filtering methods are proposed. Figure 6. Examples of noisy ECG and corresponding filtering methods. Visual analysis of noisy ECG shows that the preprocessing stage should perform three major tasks: baseline drift correction, frequency-selective filtering and signal enhancement. As a result of a series of experiments, the following combination of methods was selected for the preprocessing stage (figure 7). Wavelet decomposition: wname = 'db8', N = 9. Ws = 50 Hz, dA = 1.5. Butterworth filter, Wp = 40 Hz, Ws = 60 Hz, Rp = 0.1 dB, Rs = 30 dB. Figure 7. Combination of methods for data preprocessing stage. Baseline drift correction was implemented using multilevel one-dimensional wavelet analysis. The original signal was decomposed at level 9 using biorthogonal wavelets. 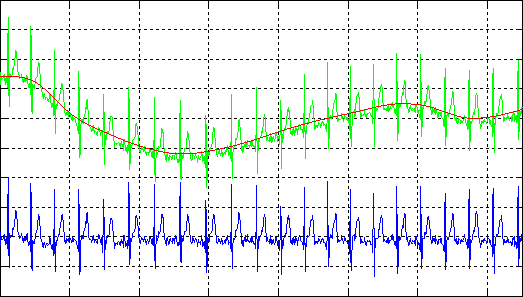 The signal reconstructed using the final approximation coefficients is assumed to be the drifting baseline, which is subtracted from the original signal (figure 8). This method shows good results in both cases of clear and rather noisy ECG signals. Figure 8. Examples of ECG baseline drift correction results. 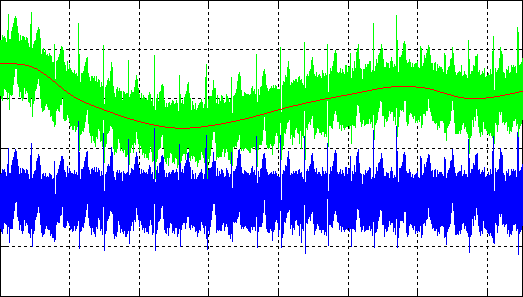 Frequency-selective signal filtering was implemented using a set of adaptive bandstop and lowpass filters (figure 9). 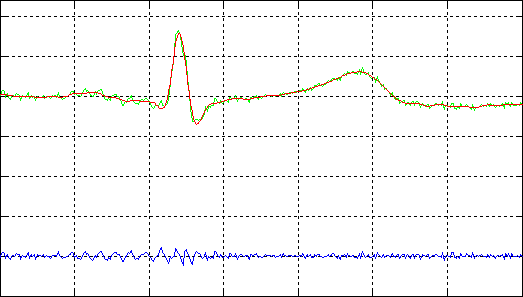 Adaptive bandstop filter fairly well suppresses power-line noise. Filtering quality is comparable with the classic bandstop filter. At the same time it has some advantages, including recursive structure, computational simplicity, and ability to adapt to some changes of power-line noise characteristics. A lowpass filter is used to remove the remaining noise components, caused by possible high-frequency distortions. Figure 9. Examples of ECG frequency-selective filtering results. Initial feature space formation is a key stage of the identification system. Although decisions made in other stages significantly influence the final identification results, feature selection determines the potential performance of the identification system most of all. Obviously, information about cardiac electrical activity is primarily contained in the cardiac cycle fragment containing the QRS complex, P and T waves. The QRS complex is the most distinctive among them. The value for identification of P and T waves is questionable. 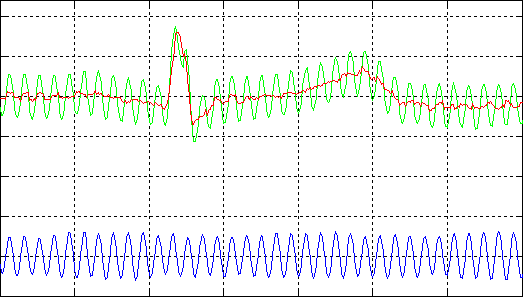 The P wave has a low amplitude and can be greatly distorted by noise. The T wave is rather changeable, since its position depends on heart rate. Including the P and T waves in the "informative fragment" (the portion of the cardiac cycle from which features used for identification will be derived) will probably add some information about the individual, but it will also add some challenges to processing methods. To evaluate the discriminative power of the P and T waves, it was decided to consider four possible "informative fragments": QRS, P-QRS, QRS-T, and P-QRS-T (figure 10). Figure 10. Variants of cardiac cycle informative fragments. Selection of the informative fragment was realized by performing the complete ECG identification system runs independently using these four variants of initial feature space formation. This experiment yielded useful results even though the complete system was not fully determined, because the prime interest was not to determine absolute performance values for each variant, but to rank them. 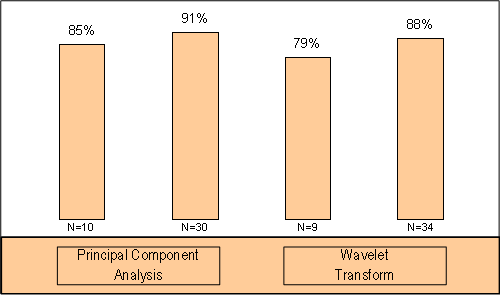 The results (figure 11) show that P wave inclusion significantly improves identification results, while T wave inclusion yields a smaller improvemement, provided that the P wave is also included. 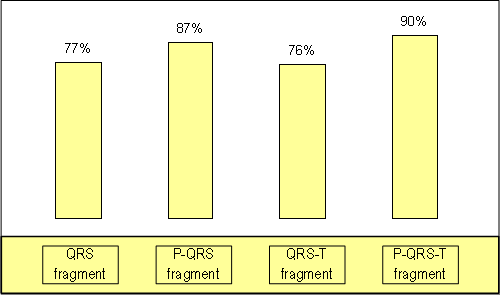 Thus, the P-QRS-T fragment was selected, named below as the PQRST-fragment. Figure 11. Test set ECG identification results for considered informative fragments. The process of initial space formation begins with extraction of a set of R peak synchronized PQRST-fragments (figure 12). PR, QRS and especially QT intervals have variable length depending on individual physiology and heart rate. Since feature vectors must have equal length, the PQRST-fragment length was fixed at 0.5 sec or 250 samples. For each cardiac cycle, regardless of the actual lengths of PR, QRS and QT intervals, 250 samples (80 samples to the left of R-peak and 170 samples to the right) were extracted and analyzed. Figure 12. Examples of R peak detection and PQRST-fragment extraction. 1. Correcting PQRST-fragment mutual "vertical" shift due to residual baseline drift. Mean values of all PQRST-fragments were subtracted, so that the corrected segments had mean values of zero. 2. Culling PQRST-fragments that are distorted due to breathing or motion artifacts, as well as pathological PQRST-fragments. From the set of 10 extracted PQRST-fragments, the "mean" PQRST-fragment was estimated (red line); using Euclidean distance, only the 6 closest PQRST-fragments were selected (blue lines) for further analysis. 3. Correcting PQRST-fragments depending on heart rate. The ST-fragment (samples from the end of the S wave to the end of the T wave) of PQRST-fragment was scaled using QT interval correction formulas. The Framingham and Bazett's formulas were considered; use of the Framingham formula gave better and more robust results. Thus in the initial feature space (dimension N=250) the ECG appears as a set of 6 PQRST-fragments with each seen as a separate pattern at subsequent system stages, to be interpreted and classified independently. Initially, the feature space dimension (or number of features for each pattern) is quite large (N=250). This fact may make subsequent processing difficult or computationally impossible. The initial features, however, may include redundant and useless information due to correlation and interdependencies between features. In other words, the informational content of each initial feature and its contribution to the distinction of classes vary significantly. The feature space reduction procedure aims to make the transition from the initial feature space, with a correlated basis, into a new feature space with an uncorrelated basis. This procedure allows significant dimensionality reduction with minimal information loss. Two methods of feature space reduction were considered: Principal Component Analysis (PCA) and Wavelet Transform (WT). Principal Component Analysis allows reduction of the initial feature space dimension N to 30 according to the Kaiser criterion, or even to 10 according to the scree test. Use of a Wavelet Transform provides the same space reduction but with slightly poorer PQRTS-fragment classification results (figure 13); furthermore, it is hard to find reasonable criteria for wavelet and decomposition level selection. In a series of experiments with different wavelets, the best results were obtained using Daubechies wavelet ('db3'), and decomposition at level 3. Figure 13. 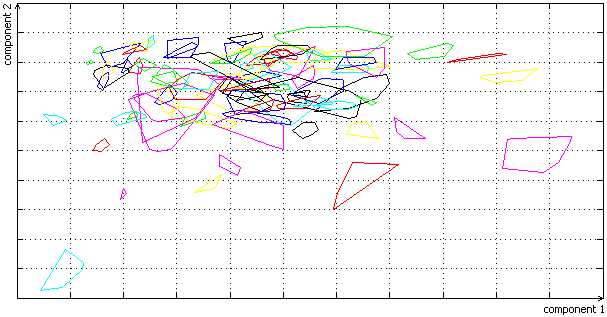 Test set PQRTS-fragment classification results for the candidate methods for feature space reduction. To explore the reduced feature space, geometric and numerical analysis were carried out. Class distribution in 2D feature space based on the first two principal components is represented on figure 14. Each PQRTS-fragment is a point in this feature space, and each class (set of PQRTS-fragments) is a set of points. For clarity, each class is represented not as a cloud of points but as a convex hull containing these points. In the figure, it is apparent that class points are well-grouped, and that some classes are separated from others and thus are easily classified; yet most classes are concentrated in the same region, and two components are insufficient for classification. Figure 14. Class distribution in the reduced feature space (first 2 principal components). To compare the initial and reduced feature spaces quantitatively, intra- and interclass metrics were considered. Usually, the class centroid is defined as the mean of all class points, so that the intraclass distance can be defined as the mean distance between the class points and the class centroid, and interclass distance as the distance between class centroids. Conceptually, intraclass distance characterizes the volume of the class or ECG variation within an individual, and interclass distance characterizes the separation of classes from each other or ECG variation between individuals. Obviously, good classification results can be achieved when interclass distances are significantly greater than intraclass distances. To analyze the feature spaces, intra- and interclass distances were calculated for all of the 90 classes, and the distributions of the minimal and mean interclass distances in the initial and reduced feature spaces were calculated for each class. Euclidean distance was used as a measure of distance. Box-and-whisker plots for calculated metrics are presented on figure 15. Figure 15. Class metrics for initial (A) and reduced (B) feature spaces. In the figure, it is clear that feature space reduction slightly increases intraclass distances. More important, however, it noticeably improves class separability, increasing both minimal and mean interclass distances. In other words, classes in reduced feature space gain some extra volume, but are more clearly separated from each other. Overlap between the plots of intraclass distances and minimal interclass distances indicates the presence of some collisions (ambiguities) in the classification. Significant separation of plots of intraclass distances and mean interclass distances indicates that, potentially, classification can achieve high performance. Of course, it is difficult to predict how the feature space will be filled with new classes (i.e., as the system is required to identify a larger number of individuals), but judging by the ratio of distances there is the potential to increase this number without losing the classification quality. 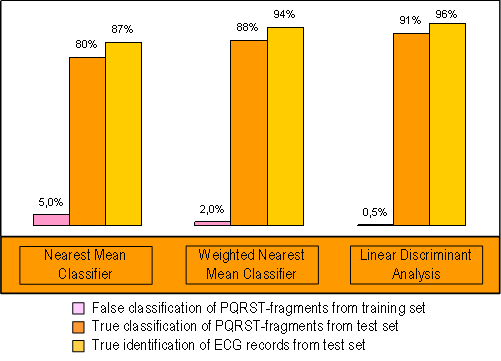 As a result of data processing on previous stages, the original ECG record is represented as a set of six PQRST-fragment patterns in the reduced feature space. At this stage, each PQRST-fragment pattern is classified independently of the others and assigned to some class, and each PQRST-fragment classification result is a vote for the candidate class of the final ECG record identification, which is elected by a majority of votes. In this research, several classifiers were considered. The Nearest Mean Classifier is a computationally simple but rather effective method in case of close to normal distribution of class patterns and almost equal variances of features values (i.e., when the class patterns fill a hyper-sphere). The Weighted Nearest Mean Classifier is a modified version, which takes into account differences of variances of different features, and the distance metric is normalized by the variances of corresponding features values within class (i.e., the class patterns fill a hyper-ellipsoid). Linear Discriminant Analysis is a classic method of classification that usually achieves good performance, even when its assumptions about normality and variances are violated. Figure 16 compares the performance of these three classifiers. Figure 16. Final results for considered classification methods. The figure shows that the results obtained are consistent with expectations. Indeed, the Nearest Mean Classifier provides quite good results. Figure 14 shows that classes typically have elongated shapes, i.e., that the variances of the different features are not equal, so that the Weighted Nearest Mean Classifier provides better results. Linear Discriminant Analysis not only provides the best recognition result in the test set, but also minimizes the recognition error in the training set. ECG record identification rate is higher than the PQRTS-fragments recognition rate, since a pair of misclassified PQRTS-fragments do not affect the correctness of the ECG record identification. As a result of this research, a recognition system was developed to solve the problem of biometric human identification based on ECG on a sufficiently large set of input data. The findings support the use of ECG as a new biometric characteristic in various biometric access control problems. Of course, it is doubtful that ECG is unique enough to be feasible for identification of large numbers of individuals in a general population. More likely, it can be useful for identification within relatively small predetermined groups, or as an additional feature in multi-variable biometric identification systems. Thus, it opens up a brand new perspective for the study of biometric technologies with potential applications in security and modern life amenity systems. Table 1 summarizes and compares the key features and results of this study with those of studies [1-3], which were available at the time of this study. Table 1. Summary of the key features of different studies. Biel L., Pettersson O., Philipson L., Wide P. ECG analysis: a new approach in human identification. IEEE Transactions on Instrumentation and Measurement 2001 June; 50(3):808-812. Yi WJ, Park KS, Jeong DU. Personal identification from ECG measured without body surface electrodes using probabilistic neural networks. Proc 2003 World Congress on Medical Physics and Biomedical Engineering, Sydney, Australia, 2003 August. T.W. Shen, W.J. Tompkins, Y.H. Hu. One-lead ECG for identity verification. Proc. of the 2nd Joint Conference of the IEEE Engineering in Medicine and Biology Society and the Biomedical Engineering Society, vol. 1, pp. 62-63, 2002.